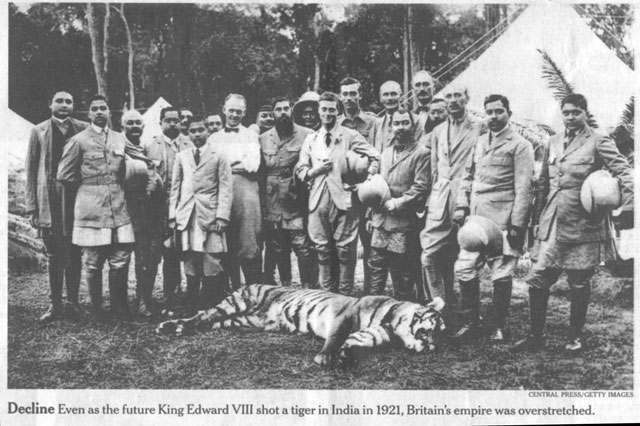 Non sequitur of the month goes to this caption in the New York Times that accompanies a story comparing the decline of the British Empire with the perceived weakening of US hegemony. Decline: Even as the future King Edward VIII shot a tiger in India in 1921, Britain’s empire was overstretched. So now you know. The next time you see a President (Palin?) standing over a fresh kill, the beginning of the end will have begun. Depends who she kills, no? Will Sarah Palin Shoot Barack Obama?